Chromium (Cr) and Copper (Cu) are associated trace elements, and considered essential to human health. Next to calcium and magnesium, chromium and copper are important nutrients for their anti-inflammatory properties. While neither one - with few exceptions - is generally found to be very deficient level-wise, chromium is on average always lower than copper, with virtually no exceptions. Copper on the other hand is elevated in the majority of patients, which creates a chronic copper / chromium conflict ratio-wise in these individuals. Of thousands of patients tested since the mid 1970s from different continents around the world, nearly 90% exhibited a chemical profile that in addition to their own unique chemistry, contained an underlying pattern that reflected the impact of elevated copper levels on various opposing nutrients, which include Vitamin C, chromium, sulfur, nickel, molybdenum, and hesperidin, an essential flavonoid, among others. There are other copper antagonists such as zinc, however while zinc is generally documented as such in the nutritional literature, it is not only the weakest of all copper antagonists, but its action on copper takes place only on an intestinal level, so once copper goes into storage, zinc will have no effect on lowering copper any longer. The only time zinc could become a threat to copper is in situations where either copper levels are already on the low side and high amounts of zinc are ingested, or when potassium and calcium - being "synergistic allies" to copper - are well below normal. Many people exhibit high levels of zinc and copper, in which case a common denominator such as Vitamin C has to be supplemented in larger amounts to help lower both, while foods such as shellfish, nuts, wheat germ (containing high levels of copper and zinc), should be avoided. One major reason why some people require a much higher intake of Vitamin C compared to others is that they exhibit very high levels of copper, which in these people interferes with nickel and Vitamin C metabolism (see "Vitamin C Supplementation"). Although chromium appears to be normal on the following graph, it is very low in ratio to copper, its associated element, so when supplementing chromium, its level will generally not go up at first, but it will gradually lower copper instead, and in the example below, potassium, since they are high in ratio to chromium. 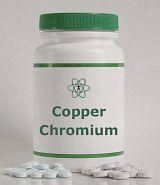 Only after copper and potassium have been reduced to normal levels, chromium may at that point start to go up. However, sufficient amounts of chromium are rarely used, so in practice, copper and potassium will just come down closer to normal, while chromium levels stay the same. Magnesium almost always goes up following long-term chromium supplementation because of its synergism with chromium, and as a result of potassium (which is a magnesium antagonist) going down, and thus not exerting an inhibiting effect on magnesium any longer. Copper is present in all tissues. The average adult body contains about 80 to 120mg of copper, of which most of it is stored in the liver. It is an important catalyst in the formation of the oxygen-carrying molecule hemoglobin. Copper is transferred by albumin across the gut wall and carried to the liver where it is formed into ceruloplasmin, a copper transport protein. Sufficient ceruloplasmin levels affect a decrease in the absorption of copper to minimize copper toxicity. Chronically elevated copper levels in most patients may result from one-sided diets that lack co-factors or copper antagonists, or from the fact that many copper-rich foods are somewhat addictive, such as cocoa, chocolate products, colas, coffee, or tea. Other copper sources include seafood / shellfish, seeds and nuts, soy products, liver, foods or beverages that are cooked or stored in copper containers (beer), tap water (copper plumbing), and copper IUDs. Due to the synergism between copper and aluminum, a higher intake or absorption of aluminum - ranging from antiperspirants, tetra packs, all the way to municipal drinking water treated with aluminum sulphate and polyaluminum chloride (used as coagulants) - will result in greater copper retention and lowered sulfur levels, since both, aluminum and copper are sulfur antagonists. High cellular copper levels, along with related sulfur deficiencies, can be considered to be one of the most prominent causes of many physical and mental health problems, including ADD and Alzheimer's Disease. Higher estrogen levels from 'hormone replacement therapy,' birth control pills, and pregnancy, increase intracellular copper and manganese levels, and they sometimes raise serum copper as well, which can contribute to changes in sugar metabolism, oxygen metabolism (asthma), and a female's mental and emotional well-being. Serum copper levels also generally increase during acute infections, whereas serum iron levels decline during that time. The only genetic association to toxic copper overload is found in Wilson's disease, which however is relatively rare. Copper Toxicity or excessive copper levels  have been associated with physical and mental fatigue, sleep disorders, depression and other mental problems, schizophrenia, learning disabilities, ADD / hyperactivity, mood swings (sometimes violent, criminal or psychotic behavior) and general behavioral problems, memory and concentration problems, some dementias, postpartum depression, increased risk of infections, vascular degeneration, hemangiomas, headaches, weight gain, arthritis, spinal / muscle / joint aches and pains, and several types of cancer. Copper is a necessary component to support angiogenesis (formation of new blood vessels in tumors), so to some extent, lowering copper reduces the risk to develop benign and malignant (cancerous) tumors. Nausea and vomiting are not only common effects from copper toxicity, but they can also be experienced when Cu is supplemented with acidic foods or beverages, on an empty stomach, or with higher amounts of ascorbic acid. This does not apply to non-acidic forms of Vitamin C such as sodium ascorbate, or calcium ascorbate. Low Copper intake can increase the risk of high serum cholesterol, coronary heart disease, irregular heartbeat, decreased pigmentation of skin / vitiligo, premature graying hair, hernias, aneurysm (bulging of a blood vessel wall), varicose veins, dermatitis, fatigue, anemia, anorexia, thyroid problems, allergies, poor healing, lowered immunity, arthritis and fragile bones, neutropenia (low neutrophils), and mood & nervous disorders. Although higher copper levels support angiogenesis with most tumors (particularly estrogen receptor-positive types), colon cancer often develops in the presence of insufficient cellular copper, calcium, and potassium levels. Menkes syndrome is a fatal disease usually affecting infants, and caused by faulty copper absorption. Some people claim that Copper Bracelets help reduce the symptoms of arthritis, whereby measurements do confirm an increase in intracellular copper from wearing these bracelets and bands. Since copper is anti-inflammatory, positive effects can be real and attributable to copper salts being formed and absorbed as a result of copper reacting with fatty acids in the skin. As long as copper is on the low side, this can be an effective way to help increase copper levels, however in someone suffering from copper overload, the extra copper absorbed from these bracelets can worsen existing medical symptoms resulting from copper levels that are already too high, or they may over time create new medical problems in individuals whose copper levels were previously normal. Copper shares many attributes with calcium, whereby both can become bio-unavailable at high levels and result in symptoms of deficiency! Some practitioners, being unaware of the underlying copper excess, and lacking the resources to test intracellular levels of copper, get temporary results by having a patient supplement more copper. Despite the initial improvement, this can have disastrous long-term effects on a patient's physical and mental health. The correct approach consists of making copper (or calcium) more bioavailable by supplementing the proper co-factors, with the best choice being those whose levels are lowest ratio-wise to copper - and as mentioned above - may include Vitamin C, chromium, sulfur (MSM), molybdenum, nickel, or (rarely) zinc. The avoidance of foods high in copper is important as well. This will take care of the medical conditions a practitioner was originally consulted for, and at the same time prevents the potential development of new medical problems elsewhere related to excessive copper intake. Chromium has to be considered first when trying to normalize copper, since it is its associated trace element. Many aches and pains, arthritis, slow-healing fractures, sciatica and other back problems, various infections, etc, can be relieved with chelated chromium (not GTF chromium), provided: a) they conform to the left side-specific receptor requirements, b) calcium and magnesium are close to normal, since they are also involved with various disorders of the musculoskeletal system, and c) potassium levels are not below normal, since chromium is a potent potassium antagonist. Following a close second is Sulfur, usually supplemented in the form of MSM, whose main action in addition to helping restore cartilage formation is the lowering of copper! So again, it is the high copper levels which created a need for sulfur to help reverse joint degeneration. Originally, glucosamine sulfate (another copper-lowering sulfur compound) had been the non-drug treatment of choice for joint problems, however its blood sugar raising potential has considerably reduced its popularity in individuals with blood sugar disturbances (e.g. diabetes), so MSM has become the preferred choice instead. Copper works synergistically with potassium and calcium, so when patients do exhibit low copper levels, then calcium and potassium are frequently on the low side as well. Supplementing 3 mg of copper for one to two weeks, or less, is all that is needed for an adult to normalize any copper deficiency, but then it should be discontinued or reduced, otherwise copper may go too high. One common effect of supplementing copper is weight gain as much as 5% or more, which is also possible when absorbing extra copper from non-dietary sources such as copper bracelets or copper IUDs. So unless gaining weight is a welcome benefit, or a reliable test indicates insufficient levels, most people should avoid mineral formulations containing either iron (which also causes weight gain), or more than 0.5 mg of copper. If an adult does experience ongoing copper deficiency due to malabsorption disorders (e.g. celiac disease), then appropriate amounts have to be regularly supplemented, or food sources with high copper content (e.g. liver) would have to be consumed on a regular basis. Cocoa products are also a good choice. While only moderately high in copper, they have superior copper bioavailability compared to other food sources. It would also be worthwhile to check if excessive amounts of copper antagonists or co-factors are supplemented, which may be the reason for low copper levels. Chromium occurs in any oxidation state from -2 to +6. Trivalent chromium (Cr+3) is the biologically active form, while hexavalent chromium (Cr+6) is potentially toxic to humans. GTF (Glucose Tolerance Factor) chromium is essential in helping regulate carbohydrate metabolism by improving the uptake of glucose into the cells so it can be metabolized to produce energy (ATP). It consists of chromium in the trivalent state nicotinic acid, and the three amino acids glycine, glutamic acid and cysteine. Chromium is able to improve cholesterol and triglyceride status, however while small amounts are necessary for normal carbohydrate metabolism and to help with blood sugar management in diabetics, supplementing higher amounts of chromium will not reverse Type II diabetes, as some sources claim. On a similar note, Chromium Picolinate (chromium + picolinic acid) does not increase lean muscle tissue and decrease body fat, as advertised by other sources. In fact, in contrast to the control groups, some of the participants in the chromium picolinate group actually gained weight (one of Dr. Ronald Roth's patients took part in that research), and one published medical report stresses the implications of analogues of picolinic acid being able to cause significant behavioral changes in those with an increased susceptibility for mood disorders. Chromium picolinate is clearly the least desirable form to be used for supplementation (see below for more adverse effects). Tissue concentrations of chromium vary considerably in people from different parts of the world, with amounts in people living in Asia for example being up to five times higher compared to those in people living in the US. These higher chromium levels may be one reason for a lower incidence of bone loss, or sugar metabolism disorders in these regions or countries. In addition, excessive sugar intake - prevalent in Western societies increases chromium loss and accelerates already declining Cr levels due to increasing age, which worsens medical conditions associated with lowered chromium levels. There are also lower soil levels of chromium in North America, and the refining process of food (sugar cane, whole grains) reduces sources of chromium as well. Exercise and trauma also contribute to chromium loss, and it is interesting to note that in laboratory animals, extra chromium supplementation resulted in a life span increase of up to 33%. Uptake of various forms of chromium, including GTF chromium is in a low 1 - 3% range, with the absorption of Chelated Chromium being usually closer to 25%, so chelated chromium is the preferable choice for specific medical applications. For instance, when chromium is used for inflammatory conditions such as an acute bladder infection (cystitis), taking 20,000 mcg of GTF chromium has little or no effect at all on improving the symptoms, while 2,000 - 3,000 mcg / day of chelated chromium will rectify most cases of cystitis, or it can be used to resolve chronic bladder infections by having patients take a lower, preventive maintenance amount in the 500 mcg - 1,000 mcg range per day. Osteoporosis of trabecular bone (spine, or end-part of bone) is frequently caused by chromium being very low in ratio to either copper, potassium, selenium, and/or rarely, vanadium. Chromium is required for proper parathyroid functions, so any of these Cr antagonists can become responsible for bone loss if supplemented needlessly, or if their levels remain too high too long for any other dietary or genetic reason. However, one other major factor that is responsible for bone loss as a result of its chromium-lowering effect particularly in Western Societies and which is being totally overlooked is Sugar, and all other Simple Carbohydrate sources! (see also "Osteoporosis" and "Sugar & Glycemic Index"). Best time to take Chromium: Anytime - with food (preferably), or without food, but hours apart from taking copper, or high-potency potassium supplements. Best time to take Copper: Anytime - with non-acidic foods / beverages to avoid nausea. Copper is best taken by itself, without any other supplements. Chromium Synergists: Magnesium, zinc, manganese, Vitamin B15. Copper Synergists: Calcium, potassium, iron, Vitamin E.
Chromium Antagonists / Inhibitors: Selenium, vanadium, potassium, cobalt, copper, iodine, Vitamin B12, rutin, sugar, alcohol, fat. Copper Antagonists / Inhibitors: Sulfur, molybdenum, zinc, nickel, chromium, tin, Vitamin B6, Vitamin C, hesperidin, insoluble fiber. * Dose-dependent - They are co-factors at normal levels, and antagonists at higher levels. Low Chromium: Reduced glucose tolerance / impaired glucose metabolism, weakened immune system, increased susceptibility for infections (e.g. bladder, left tonsil), trabecular bone loss, inflammatory joint disease, elevated total cholesterol, birth defects, reducedlife expectancy, nerve degeneration. Low Copper: Anemia, increased susceptibility for infections, weakened immune system, hormonal disorders, increased risk for (colon) cancer, miscarriage, trabecular bone loss, inflammatory joint disease, premature graying of hair / loss of hair color, vascular degeneration, insomnia, stroke, irregular heart beat (arrhythmia), weight loss, leukopenia, nerve degeneration, cardiomyopathy (in rats). High Chromium: Spinal / joint degeneration, depressed immune system, lymphatic swelling. Please Note: Additional (rare) overdose / toxicity symptoms are the result of a high chromium intake causing deficiencies of other elements or nutrients. These are found in their respective "Deficiency" category and include potassium, copper, vanadium, selenium, cobalt, iodine, Vitamin B12, and rutin. High Copper: Wilson's disease, anemia, nausea, vomiting, abdominal pain, moodiness, violent behavior, ADD / ADHD, depression, confusion, weight gain, hemangiomas, arthritis, joint / spinal degeneration, higher risk for some cancers, vascular degeneration (aneurysm, bruising, hemorrhoids, varicose veins), increased susceptibility for infections, heart disease & stroke. Weight gain, behavioral disorders / psychotic symptoms, headaches, confusion, depression, irritability, insomnia, tachycardia, arrhythmia (irregular heart beat), atrial fibrillation, chest pain, erythema / flushing, dehydration, agitation, dizziness; possible nephrotoxicity, cognitive, perceptual, and motor changes. Chromium Sources: Brewer's yeast, beef, liver, chicken, dairy products, eggs, potatoes, whole-grain products, fish / seafood, green peppers, bananas, beer, drinking water. Copper Sources: Wheat germ, oats, fish / shellfish, mushrooms, tea, soybeans, seeds, coffee, cocoa products, liver, nuts, drinking water (copper plumbing), copper IUDs.